In 2003, London professor Elroy Dimson scientifically proved a 100-year-old investing secret. His research showed this: When using two identical investment portfolios, you could increase your profits 85-fold in one of the portfolios by using a little trick. I call that trick the Extra Dividend Wealth Formula. Let me reveal what made such a difference in the returns of the two identical portfolios. The idea is so simple that you might be quick to dismiss it. I’d caution you against doing that. If you can keep an open mind, this little investing trick could transform your results... the same way it’s been transforming the results of ordinary investors for more than a century. You see, Dimson worked with dividends. Companies generate profits through their day-to-day operations. With these profits, the company can choose to reinvest this money into the business or return it to shareholders through cash payments. Investors call these payments dividends. As an investor, you should treasure dividends. They mean the company is shareholder-friendly. They’re also a sign of a company’s financial strength. Companies that pay dividends are financially-secure enough to be able to pay out excess cash rather than needing it for things such as debt payments or equipment maintenance. What this London professor found was that by reinvesting the dividends in one of the two identical portfolios, he could increase the returns of that portfolio by 850%. The chart below shows Dimson’s two portfolios and their respective cumulative returns. 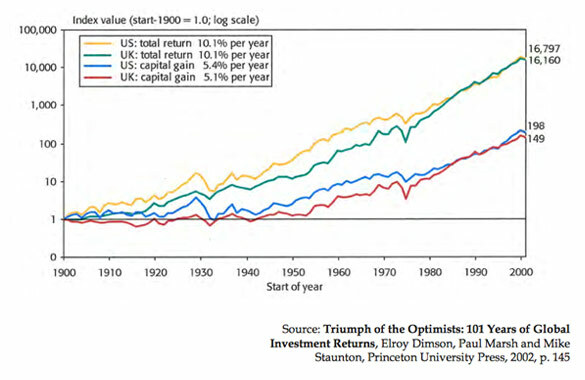 This study spanned U.S. and U.K. stocks from 1900 to 2000. Notice the yellow and green lines in the above chart. They account for dividend reinvestment—the portfolio in which Dimson reinvested all the dividends he received from each company (there are two lines because they follow two markets: the U.S. and the British markets). In other words, in this portfolio, Dimson assumed that any earned dividends would go toward purchasing additional shares of the same basket of stocks. The blue and red lines represent the returns of U.S. and British portfolios that don’t include any dividend reinvestment—the portfolio Dimson left alone. In these accounts, Dimson assumed the investor took his/her dividends and did not use them to buy more shares, as with the other portfolio. As you can see, the difference is huge. What we learn from this is the power of reinvesting dividends. When Dimson reinvested the dividends of one portfolio, it generated nearly 85 times the wealth of the other. The Extra Dividend Wealth Formula vastly outperformed non-reinvestment strategies. Armed with this scientific research, I started to do some digging of my own. I discovered that there’s more to this story. Simply reinvesting dividends falls short of the true moneymaking potential of this formula. Most companies that let you reinvest dividends do it through what’s called a “DRIP” (dividend reinvestment program). This is a plan by a corporation that allows investors to reinvest their cash dividends. They do this by purchasing additional shares or fractional shares on the dividend pay date. But when I started digging deeper, I found that some companies offer more than just a regular DRIP. In fact, certain companies will also give you a big discount on reinvested shares. It means that not only can you reinvest your dividends, but you can also buy more shares with the same amount of money. That’s more than you could have bought otherwise. It’s like having special access to shares that are “on sale.” If you take advantage of these programs, you’ll have a larger pot of shares that’s generating dividends. That’s because you’ve reinvested the dividends in shares that are selling at a discounted price. By now, you might have noticed an important shift in this story. You see, I think Dimson’s study fell short. Sure, boosting returns 85-times is an impressive feat. But Dimson fails to consider a few other factors. These missing factors, when used together, could take your portfolio to a completely new level. Let’s now say you invested the dividends from Dimson’s study in not just one, but in bothof those identical portfolios. The portfolios would generate wealth at the same 85-fold pace that Dimson found. But now, in one of the portfolios, let’s say you reinvested your dividends and bought your new shares at a discounted price. After 20 years, you’d have significantly more shares in that portfolio. And that increased number of shares would generate more dividends with each passing year. This would magnify your returns even more than Dimson’s study indicates. This may seem obvious. Or non-significant. But the difference between these seemingly-small adjustments is like being on a twin-engine propeller Cessna versus a four-engine jet 747. They’re both airplanes, but the 747 is going to get you to your destination—wealth—much faster than the Cessna. In the next few pages, I’m going to focus on companies that build upon Dimson’s findings. But I’ll also go a few steps further. Actually, I’ll take it four steps further. Each step represents another way I’ve found to improve the Extra Dividend Wealth Formula. Being able to buy shares at a discount is just one of the improvements. I’ll also show you three more key ingredients that’ll accelerate the wealth-building nature of this formula. Dimson’s findings about reinvested dividends are certainly remarkable. But they’re just the beginning. The four additional steps I’ve identified super-charge the wealth-generation process. The first ingredient of my modified Extra Dividend Wealth Formula is a discounted dividend reinvestment program. A company must have a program in place that allows you to reinvest your dividends at a discount—as in, buying shares below the market price. You may not have realized this is even possible. I wasn’t aware of it until I finished my own lengthy research. When I first started looking into Professor Dimson’s study, I was shocked to discover that some companies offered a “special sale” on shares for those who reinvested their dividends. I also found another interesting thing: Most investors don’t know about these hidden dividend reinvestment programs, either. That’s why the stocks with these programs are genuine financial secrets. We couldn’t find any mention of them in the Wall Street Journal or New York Times in the last 30 years. So difficult, in fact, that even after hours and hours of research, I found only about 100 companies on U.S. exchanges that offer a discounted dividend reinvestment program. Of those 100, only two made this report (I’ll reveal them later). By the way, if you know anything about DRIPs, you might be wondering if it’s really worth it. That’s because many DRIPs offer only small discounts of 1-3%, and they charge a host of fees. The DRIPs you want should be low-to-no cost and free of fees. And preferably, they offer discounts greater than 3%. The two companies I’ll tell you about today meet both these requirements. You’ll hear more about them in a minute, but first let’s get through the other ingredients of my formula. This next ingredient accelerates your wealth accumulation—it’s the “speed ingredient.” It’s like adding a catalyst to a chemical reaction... suddenly, things start happening faster. It’s called the dividend growth rate. This is how fast the dividend grows. The higher your “speed ingredient,” the faster you’ll hit your wealth goals. For the Extra Dividend Wealth Formula, I only focus on those companies with a proven track record of regularly raising their dividends. This way, the faster the dividend grows, the more discounted shares you can buy. Let’s say you have two companies, Company A and Company B. They both issue a $3 dividend in their first year. That means, as an investor, you receive $3 from each company for every share you own. You decided to reinvest your dividends from each company back into more stock. Company A consistently increases its dividend rate at 10% per year. Company B raises it one year... doesn’t the next... raises it a little the following year... In the end, it averages out to a growth rate of about 4% a year. At that end of five years, Company A—with 10% growth—is now paying you $4.83 per share. But Company B—with the 3% growth—is only paying $3.47. The results are even more pronounced if we look out to ten years. In the tenth year out, Company A is paying you $7.78 per share. Company B? Only $4.03. That’s only a little over half. That’s how important a consistent, increasing dividend growth rate is. Each year, that ever-growing dividend is buying you more and more stock. It’s like owning a car that has a self-filling gas tank. Let’s look at another ingredient. A payout ratio is one of the most important statistics in evaluating any dividend-paying stock. It measures the percentage of earnings that shareholders receive in the form of dividend payments. You want this number to be high. Imagine a company pays a quarterly dividend of $0.25 per share. Shareholders would receive a total of $1 in dividends this year. Now, analysts forecast that the company will have earnings of $2 per share this year. To find the payout ratio—the percentage of earnings distributed as dividends—divide dividends per share by earnings per share. So, $1 divided by $2 equals a payout ratio of 50%. This is a tricky interpretation. Ideally, you’d like your payout ratio to be high, because it means more earnings paid to you as a shareholder. If the ratio is too low, you’re receiving only a small portion of earnings. At the same time, a low payout ratio has its merits too. You see, with a low payout ratio, it means there’s room for growth in the dividend payment. For instance, if the payout ratio is only 20%, the company could likely increase it to 30% or 40% in the coming quarters without hampering cash flow too significantly. If the payout ratio is currently 90%, how much more can the company pay out to its investors? It’s already distributing 90% of its earnings. The most it could increase is that remaining 10%. Let’s say a company has a 50% payout ratio. It makes $2 per share and pays its shareholders $1 per share. But what happens if there’s a bad year? What if earnings decline by 50%, for example? In that case, earnings would drop from $2 to $1. Well, that would still cover the dividend payout. Now, let’s say the payout ratio was 75% (meaning the company paid out $1.50 in dividends). Then earnings could only drop 25%—from $2 to $1.50—before the dividend would be at risk. That’s because a 75% payout ratio would also equal $1.50 of the total $2 earnings. What if the payout ratio was only 25%? Well, earnings could technically suffer a 75% drop and still be able to fund the dividend. There’s no real magic number to use when looking for a good payout ratio. It differs by company and sector. Utility companies typically have higher payout ratios. They operate in a mature, stable, and regulated industry. On the other hand, many technology companies have lower payout ratios. Tech companies are usually more concentrated on growth. That means they’ll retain earnings in order to reinvest in research and development. Or they’ll look to acquire smaller companies. But for the sake of the Extra Dividend Wealth Formula, what we’re looking for isn’t necessarily a small or large payout ratio... We want companies that are increasing the payout ratio. We’re searching out companies committed to continually rewarding shareholders by paying them greater percentages of profits. Earnings are a critical component to the Extra Dividend Wealth Formula. In particular,accelerating earnings. Companies are only able to pay dividends from profits they have generated in the form of earnings. Therefore, to get the most from our formula, we need companies with accelerating earnings, because it enables bigger and bigger dividends. Let’s say a company has earnings of $100 million. With a 50% payout ratio, investors will receive $50 million in the form of dividends. If the same company has a 10% earnings growth rate, it will earn $110 million a year later. Even if the payout rate doesn’t change, the dividend will still grow to $55 million (50% payout rate multiplied by $110 million in earnings). That’s a 10% increase in dividends. Now, if the payout ratio also grows, it boosts the dividend even further. Let’s assume that the payout rises to 60%. On $110 million in earnings, you’ll see $66 million paid out in dividends. That’s a 32% increase. Hopefully you are recognizing just how powerful this wealth formula is when a company fulfills all four ingredients. Fortunately, the companies I found for you do just that. Faster-growing earnings will mean faster-growing dividends. Faster-growing dividends mean more shares—discounted shares—when reinvesting those dividends. And discounted shares means you’re able to buy even more shares! The two stocks I’m about to reveal meet all these requirements. Some of the most exciting stocks are boring, stable businesses about to undergo a massive change. For instance, you could have bought the dull glassmaker, Corning, for $7 per share in 1998. The company had puttered along for a century making industrial and consumer glass. It was an unexciting, but steady, business. Suddenly, an overnight demand emerged for fast, fiber-optic cable. Corning happened to be one company large enough to fill that demand. In 1998, you could have bought Corning for $7. Just two years later, the stock hit $112. The explosive demand for fast, fiber-optic data cable drove this “boring” stock 1,500% higher. Now, there is another company in the same position as Corning was in 1998. Like Corning, its business is both boring and predictable. And just like Corning, it’s the only major player with the infrastructure in place to meet a brand-new industry demand. I’ll get into the details of that industry boom in a moment. First, let me give you a hint: This happens to be a water utility stock. Now generally speaking, I have not been a fan of utilities. This is because utilities use a lot of debt. With interest rates rising, it causes debt expense to rise. When debt expense rises, earnings suffer. And if earnings suffer, so do the dividends. This company happens to be an exception to that rule. It has a smart management team. That isn’t a hyperbole. Over the last couple of years, management has been shedding its high-interest rate debt. And it’s been replacing it with cheap debt. What I mean by that is this company has replaced all of its loans that had high interest rates with loans that only have a 4% interest rate. In fact, the company has done this so successfully that, according to the most recent SEC filing, the company has the lowest cost of debt of any utility company in America. It gets better. That’s because the company has locked in these low rates for the next 28 years. They now have a long-term supply of very cheap financing. So interest rates can go wherever they want to go—this company is protected. Now, up to this point, this company has grown primarily through acquisition. It has a proven track record of buying up poorly-run, private and municipally-owned water utility and treatment plants. Then it modernizes the plants, fixes the inefficiencies, and eliminates redundant costs. It has been a very successful business model. This company has completed more than 200 successful deals over the last 20 years. That’s an average of 10 acquisitions per year. Now, I told you the business is boring. There is nothing exciting about rehabbing water treatment plants. But it’s profitable and steady. And that’s what’s important—this company’s current and future utility business is steady and secure. This consistent source of revenue (the old boring way) enables my first company to be more aggressive with a new strategy. And it’s this new strategy that could mean big growth for this company. This new strategy ties into the U.S. Shale Boom. And if it plays out as I expect, it will mean big things for your dividends. I’ll explain how this company meets each criteria of my modified Extra Dividend Wealth Formula in a minute. But first, let’s talk more about the U.S. Shale Boom and this company’s new strategy. What is it, exactly? Fracking is a drilling technology that gives oil and gas exploration companies access to energy reserves that would otherwise be unrecoverable. The technology blasts water and sand into well sites at extreme pressures. This pressure cracks open the rocks in the shale formations, which then releases oil and gas. This company is currently working on a way to make those water trucks obsolete. That’s not a typo. They’re actually devising a way to eliminate the need for trucks altogether. How do you make an entire trucking industry obsolete? By building a direct-water pipeline to the drillers. That is exactly what this company is doing. It’s laying water delivery systems that run straight into the heart of the Marcellus Shale region. That’s a huge shale field that covers much of western Pennsylvania. This is just beginning to emerge as a growth story for my first stock pick. As I write this, the new fracking technology accounts for under 2% of the company’s business. That means we’re at the beginning of a whole new company growth cycle. The name of this emerging powerhouse is Aqua America (NYSE: WTR). At the time of this writing, the stock is trading at $24. The company has a market cap of $4 billion and revenues of nearly $800 million. Earnings have been compounding at 10% per year for the last 20 years. Over the last 68 years, Aqua America has never missed a quarterly dividend payment.Standard and Poor’s ranks the company’s credit at A+. First, the company offers a 5% discount on its dividend reinvestment program. If you recall, only 100 companies even offer a discount program at all. Most of the ones I found offered smaller discounts of 1-3%. But they also charge start-up and transaction fees. Aqua charges no such thing. Second, the dividend has been growing at 8% per year for the past 10 years. Analysts project the company’s future dividend growth to hit 10% per year. This will come through the increasing payout ratio in just the same way I showed you in the earlier example. Third, this company has a payout ratio at 52%. The average for the industry is about 70%. That’s higher than this company’s ratio currently, but it’s good news for investors. It means there’s room for growth. In fact, the company has publicly stated its goal is to increase the payout ratio to 70%. And that growth will mean more money for you each year as the ratio increases. Finally, earnings have been growing at 10% per year for the last 20 years. This is already outpacing the S&P 500 average, which is around 9% for the past 23 years. These numbers don’t reflect the massive change that’s happening in the fracking industry. They’re just based on the company’s current utility operations. Just like Corning experienced in 1998, the potential impact of a whole new industry boom has yet to be reflected in the price of this stock. To help estimate the future market value of a growth stock, analysts use something called the price to earnings ratio (P/E). In my opinion, a good rule of thumb is that, for a growth stock, the P/E ratio often mirrors the company’s compound annual growth rate. Historically, Aqua America’s average P/E is 24-times its earnings. But it has a current P/E of 18. That means that as I write, the stock is trading at a 25% discount to its normal P/E. What this tells us is that this stock is cheap on a historical and relative basis. It’s worth owning at current valuations, with or without the impact of this coming boom. Based on its fundamentals alone, I expect the stock will continue to grow at about 12% per year. That’s around the compounded annual growth rate we’ve seen in this stock’s return for the last five years (this return is adjusted for dividends and stock splits). As I write, this company is trading at about $24. At its average growth rate over the last five years of 12%, that gives us a $75 stock price in 10 years. Unlike Aqua America’s utility business, providing drilling water is completely unregulated. There is no government oversight telling it what to charge. The implications of this are huge. It means the company is allowed to sell the water for the highest premium that the market will bear. By law, Aqua America can charge no more than $0.01-0.015 per gallon to its utility customers. But because its pipeline business is unregulated, it charges drilling clients $0.07 per gallon. That’s a 466% increase. Even at that increased price, it’s cheaper for drillers to buy water from Aqua America. The alternative is to employ hundreds of truckers to drive the water in and the wastewater out. What this means is despite the higher water costs, there’s a large incentive for drillers to stick with Aqua America for future jobs. It’s estimated that more than 80,000 wells could be drilled in the Marcellus Shale region. Aqua America charges $70,000 per million gallons of water. The average well in the Marcellus region consumes almost 4 million gallons of water. That’s $280,000 per well in water fees. This gives us a potential market of $22 billion. For each 10% of the market that Aqua America can capture, it will result in servicing 8,000 wells. That will translate into $2.2 billion of new business. Considering the company has profit margins of 30%, this means we could see another $660 million drop to the bottom line for each 10% of the market that the company secures. Remember, I want you to own a company that is expanding its earnings—growing earnings mean growing dividends. This is one of the four ingredients that maximize the wealth-building potential of the Extra Dividend Wealth Formula. Let’s be super conservative and assume it takes 10 years for this scenario to play out. With the water utility business already in place, this equates to combined operational earnings of about $1.2 billion in 2024. That estimate includes the earnings from traditional operations and estimated pipeline operations. To find the projected value in 10 years, first let’s assume that Aqua will revert to its average P/E, which is 24. Under this scenario, that would value the company at over $28 billion (24 x $1.2 billion = $28.8 billion). As I write this, there are almost 177 million outstanding shares. That gives us a stock price of $163 per share ($28.8 billion / 177 million). A run from a stock price of $24 today to $163 in 10 years equates to an average compound return of 21%. We can buy Aqua America now for just $24 per share. During those years, if you were looking to secure a home loan, chances were good you’d have no problem at all. Back then, banks were in the throes of a reckless lending period. Their lax vetting standards meant they could issue loans to people with faulty financial histories. The problem was banks lent a lot of money during these years. And too many people who shouldn’t have qualified for home loans received them anyway. I go into more detail on why banks took these risks in another special report called Warren Buffett’s Secret 600% Investment. But what you should know now is that eventually, interest rates rose. This meant those unqualified people who received loans with floating rates had a harder time paying them back. In fact, by 2008, 14% of the $9.9 trillion residential mortgage market was in foreclosure. This happened while housing prices started to collapse. That meant those people’s homes were becoming less valuable than at the time of their purchase. Lesser qualified homeowners had less incentive to make payments on their home. So many didn’t... Banks didn’t recoup the money they’d lent... and the value of the homes on their balance sheets were only a fraction of their former values. The result of all this was the U.S. banking system was devastated. It tottered on the verge of insolvency. Without the U.S. government’s Troubled Asset Relief Program (TARP), the entire system might have collapsed. Since then, investor sentiment toward banks has been suspicious, if not blatantly negative. The bias formed during the financial crisis still lingers. Over the past five years, the government has tried to remedy the fall-out of the financial crisis by deliberately driving interest rates lower. It has done this by buying up trillions of dollars of U.S. Treasury bonds. And so far, it’s been a success—long-term rates have been in the 3-4% range for several years now. But not all good things can last. In 2013, the Federal Reserve System announced it will stop buying bonds starting in 2014. 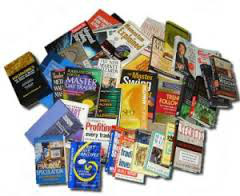 I get into the specifics in another report titled How to Survive and Prosper in the Coming Income Crisis, which I encourage you to read. But what you need to know now is that once the Fed stops buying bonds, interest rates will rise. And only certain companies are set up to avoid the fallout that’s coming. As it turns out, this next company is one of them. Its business model is simple: This company borrows money at a cheap interest rate from its depositors, and then it relends that money out at a higher interest rate to customers. The difference between the bank’s borrowing rate and its lending rate is called the net interest margin (NIM). When this spread is high, it means the company is pocketing more dollars in profit. For example, if I asked you to borrow $100, you might charge me 1% in interest. Now, let’s say I lend that money to my neighbor. I’m going to charge him 5% interest. If I have to pay you $1 for borrowing your money, but I get $5 from my neighbor, then I get to pocket $4. That’s an NIM of 4%. The average net interest margin in this company’s industry is a little more than 3%. This company’s net interest margin is 4.2%. That’s 40% higher than industry average. As an investor, you want the NIM to be large. It means higher earnings. And of course, from earnings come dividends. Let’s look at how well this company performs when compared to our Extra Dividend Wealth Formula criteria. I’ll give you a clue: You’re about to witness a stellar performance. To jog your memory, I’m looking at four upgrades to Dimson’s Extra Dividend Wealth Formula: a discounted reinvestment program, a consistent dividend growth rate, an accelerating dividend payout rate, and accelerating earnings. First, remember that I found only 100 companies that offer a discount on shares for reinvested dividends. And most of these companies offer discounts amounting to just 1-3%. On top of that, they charge hefty fees. My second company offers a discount that currently stands at 5%. That means we can reinvest our dividends back into the stock at a 5% discount to the market. That’s like paying $0.95 for a $1 bill. On top of that, this company charges no transaction or startup fees. What this means is we’ve successfully met the first criteria of our formula. Next, we want a company that has a consistent dividend growth rate. The faster dividends are growing, the more shares we can buy (and at a discounted rate). In 2011, this company grew its dividend by 12%. In 2012, the dividend increased by 32%. In 2013, the company grew the dividend again—this time by 46%. These numbers absolutely crush the average 5.4% dividend growth rate of the S&P 500. Consistent dividend growth rate? Check. The third ingredient we want to see is an accelerating dividend payout rate. Before the financial crisis hit, this company used to pay out 85% of its earnings to shareholders in the form of dividends. But faced with this once-in-a-generation crisis, the management team took the prudent route. It scaled back its payout rate. By cutting the payout rate, the company reduced the amount of dividends received by shareholders. But this hit management’s pockets, too. That’s because management owns 9% of the stock. This was the same thing as giving the senior heads a pay cut. But I see this as a good thing. What this means is that we are dealing with a rational management team. It makes decisions that are in the best interests of both the company and all of its shareholders, not just insiders. In 2012, the company felt confident enough to start raising the payout ratio. It hit 27% in 2012. Then it hit 37% in 2013. And this is exactly what we want to see. We want a low current payout rate that is starting to rise again. As management becomes more confident about the future, they will raise the payout rate further. Remember, they own 9% of the stock, so it’s in management’s best interest to increase the dividend. The higher the payout rate, the more money shareholders receive (that includes management since it owns so much stock). That equates to more free extra dividends for us. Finally, what about our fourth and final criteria, earnings growth? Since the dark days of the lows of 2009, we’ve seen this company grow its earnings at about a 50% compounded annual growth rate. In the same period, the S&P 500 has only grown its earnings at a 15% annual growth rate. Now, consider the scenario I told you about earlier. Companies like this one profit off widening net interest margin (NIM) spreads. Here’s something interesting: That growing gap is actually government-sanctioned. I’m not kidding. Read that this way: The government is actually engineering a way for this company to make money. What we have is a company that hiked its dividend by 46% last year. It grew its payout rate 37% since 2012. It increased its earnings at a 50% clip since 2009. Plus, it offers a 5% discounted dividend reinvestment program. What is my second Extra Dividend Wealth Formula recommendation? The name of this Extra Dividend Wealth Formula Company is Union First Market Bankshares Corporation (NASDAQ: UBSH). Union First is a Virginia-based bank holding company. It operates more than 90 branches and 150 ATMs in northern Virginia. It is the largest community bank in the state. Union First is a locally-focused community bank that offers traditional lending services—think mortgages and general bank loans. Its core target market is small to medium-sized businesses. A review of the numbers shows that Union First is earning those outsized returns even while following a conservative strategy. Its cash reserve ratios are 60% higher than required by law. Part of the reason why Union First is able to keep more cash in reserve is because it’s being smart in its lending practices. For instance, the bank has reduced its holdings of non-performing assets by 17% over the last year. Cash reserve ratios are the amount of money that the bank has to keep in cash as security against its loans. It cannot lend out these reserves. Banks that have high net interest margins usually lend out as much money as is allowable given their cash reserve ratios. But that is not true for Union First. The bank keeps 60% more cash than it needs to by law. This tells us that Union First is avoiding taking on more risk. Instead of lending money to anyone with a heartbeat, the management team is being prudent in its lending. If it wasn’t, then it wouldn’t be carrying excess reserves. The fact that it has excess reserves means the bank is being selective in its loan approval process. Our second clue of a prudent management is the recent drop in non-performing assets. Non-performing assets are loans that people don’t pay back. When non-performing assets drop, it means that fewer loans went bad. It’s a wonderful thing in the banking world if this number goes low. So here’s what’s great about Union First: It’s taking less risk and making more money. We know that’s true because the company’s net interest margins are 40% higher than industry averages. Even better, these margins will grow as interest rates rise. And remember, the U.S. government is making sure that happens. So what’s behind all these strong numbers from Union First? Our second growth factor is location. Forbes Magazine recently ranked Virginia as the country’s most business-friendly state. Virginia is a hot bed of corporate growth. Its improving economy has helped Union First’s loan portfolio tremendously. Last year alone, the state of Virginia produced $446 billion in economic output. As the largest community bank in Virginia, Union First will continue to benefit from the state’s economic growth. The combination of higher net interest margins, lower loan losses, and a resurgent local economy has powered earnings higher for Union First. Earnings have already grown from just $0.19 per share in 2009 to an estimated $1.57 in 2013 (full year 2013 numbers aren’t out as of the time of this writing). Over that same period, the dividend has increased from $0.30 per share to $0.56 per share. Given all this growth, what’s the stock really worth? Regional banks normally trade for 2-times book value. Right now, we can own Union First for just 1.4-times book value. That is cheap. We know it’s cheap because before the financial crisis in 2008, Union First would routinely trade at over two times book value. Even during the market meltdown of 2002, the stock still traded at two times book value. Union First has a five-year earnings growth rate of about 50%. Match that with a double-digit dividend growth rate and the ability to buy in more shares via the company’s 5% reinvestment program—and now we’re looking at accelerated wealth. There’s no question in my mind—this stock registers a buy. It’s cheap, growing, and safe. And you get additional shares at a discount. As Wall Street starts to warm up to the idea of owning banks stocks again, we will see the stock price steadily rise. Analysts project book value will hit $18 in 2014. If over the following three years the stock returns to trading at just two times book value (again, typical for regional banks), it would be worth $36. That’s a 45% increase from Union First’s stock price as I write this. Over the next three years, $36 is exactly where I expect this stock to be. And over that same time, I would not be shocked to see the dividend double from its current $0.56 to $1.12. At its current price of $24.79, that would give you a capital gain of 45%. That’s all in three years’ time. Plus, don’t forget... you get a 5% discount on reinvested dividends. That will increase your return even more. I’ve researched many companies before delivering this report to you. And while these two might not be the sexiest investments, there’s nothing boring about compounded, accelerated wealth-building. These companies allow you to accumulate their shares, year after year, at a special “on sale” price that’s not widely-known to the public. And I wouldn’t encourage you to invest in just any discounted program—these two companies have solid financials. They truly maximize each of my modifications to Dimson’s Extra Dividend Wealth Formula. Here are the steps to enrolling in the Union First Market Bankshares (UBSH) dividend reinvestment Program. There is no cost for their dividend reinvestment program and if you want to add to your position you can do so with zero commissions. Print the dividend reinvestment form found at this link and make the election for the dividend reinvestment program. If you want it to get there faster you can fax it to 908-497-2320, marked Attention: DRP Dept. If email is better for you then you can email a signed filled out copy to info@rtco.com, RE: DRP Dept. It’s a good idea to follow up with a call to the transfer agent just to make sure that they received your paperwork. You can reach them on 800-368-5948. Just hit zero when you hear the prompts and you’ll be put right through to specialist. Here are the steps to enroll in the Aqua America (WTR) dividend reinvestment Program. There is no cost for their dividend reinvestment program and if you want to add to your position you can do so for zero commissions. There are two ways to own shares and get enrolled into the Aqua America Dividend reinvestment program. You can either buy the shares from your broker and then transfer them to the transfer agent; or you can buy the shares directly through the transfer agent with zero commissions. Here are the details for both methods. Buy the amount of shares you want from your broker. Use this link to open a brokerage account directly with the transfer agent. When you fill out the form online you’ll be asked if you want to enroll in the discounted dividend reinvestment program. Make sure you mark yes. Fund your account with either a check or a direct online deposit. Buy your commission free shares.